There is a great deal of controversy about whether GMO products are harmful. GMOs (genetically modified organisms) are made by scientists in a laboratory by removing a gene from the DNA of another organism, (plant, animal, bacterium, or virus) and adding them into the DNA of the plant or animal they want to alter. That sounds scary on the face of it—Frankenfoods, yikes! Think of the things that could go wrong! And I’m the last person who would cast aspersions on anyone thinking like that. Almost everybody wants to know that the food they eat and give their children is safe and will have no unforeseen side effects on human health and the environment. At Maisie Jane’s we care a lot about healthy eating and healthy farming. It’s an enormously important part of what we do. On the other hand, some GMO products have been designed precisely for beneficial health reasons. For example, there’s a strain of rice called “golden” rice that provides an extra boost of beta-carotene to the diet—an antioxidant that’s good for your eyes and skin. There are also soybeans whose fats have been changed to be more heart-healthy and animal products that now contain more omega-3 fatty acids that help protect against heart attack, stroke and a variety of other diseases. There are also a number of GMO innovations that were designed specifically to help farmers increase crop yields, presumably to help feed an ever growing population in certain parts of the planet. That is, however, exactly why some GMOs have gotten a bad name. Some GMO crops were designed to decrease the need to use pesticides and make them resistant to a variety of weed killers. And that has led to vastly increased use of herbicides such as glyphosate which has been shown to have harmful effects on the farmers using it and on certain birds, insects and other wildlife. And many people fear that these particular crops have had an extremely detrimental effect on their health as well. Fortunately, almonds are inherently a non-GMO food crop. All Maisie Jane’s almonds are cultivated using traditional agricultural techniques and grown without the use of genetic engineering or genetic manipulation. And in addition to our own growing, the secondary ingredients that Maisie Jane’s buys from other growers are also GMO-free. We require documentation that meets these standards from every vendor we partner with. 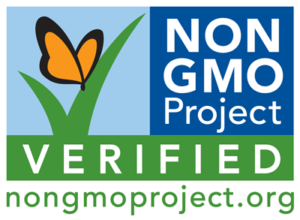 Many, if not most, of our products are Non GMO Project Verified. Feel safe about the food you eat at Maisie Jane’s!